Many elections now have some sort of online black box that allow you to see which political party or candidate has the highest overlap with your own personal political opinions. This is intended to help voters with their decisions. However, the black boxes usually lack any documentation regarding how different are the viewpoints of the competing parties / candidates. Exploratory data analysis via Neighbour-nets may be of some use in these cases. As a European Union citizen (of German and Swedish nationality) I am entitled to live and work in any EU country. I currently live in France, but I cannot vote for the parliament (Assemblée nationale) and government (M. Le Président) that affects my daily life, and decides on the taxes, etc, that I have to pay. However, I’m still eligible to vote in Germany (in theory; in practice it is a bit more complex). The next election (Budestagswahl) is closing in for the national parliament of the Federal Republic of Germany, the Bundestag (equivalent to the lower house of other bicameral legislatures). To help the voters, a new Wahl-O-Mat (described below) has been launched by the Federal Institute of Political Education (Bundeszentrale für politische Bildung, BPB). This is a fun thing to participate in, even if you have already made up your mind about who to vote for. Each election year, the BPB develops and sends out a questionnaire with theses (83 this year) to all of political parties that will compete in the election. The parties can answer with ‘agree’, ‘no opinion / neutral’, or ‘don’t agree’ for each thesis. The 38 most controversially discussed political questions have been included in the Wahl-O-Mat, and you can also answer them for yourself. As a final step, you can choose eight of the political parties competing for the Bundestag, and the online back box will show you an agreement percentage between you and them in the form of a bar-chart diagram. But as a phylogeneticist / data-analyst, I am naturally sceptical when it comes to mere percentages and bar charts. Furthermore, I would like to know how similar the parties’ opinions are to each other, to start with. An overview is provided, with all of the answers from the parties, but it is difficult to compare these across pages (each page of the PDF lists four parties, in the same order as on the selection page). The Wahl-O-Mat informs you that a high fit of your answers with more than one party does not necessarily indicate a closeness between the parties — you may, after all, be agreeing with them on different theses. This means that the percentage of agreement between me and the political parties would provide a similarity measure, which I can use to compare the political parties with each other. But how discriminatory are my percentages of agreement (from the larger perspective)? There are 33 parties that are competing for seats in the forthcoming Bundestag, one did not respond. Another one, the Party for Health Research (PfHR — a one-topic party) answered all 36 questions with 'neutral'. However, the makers of the Wahl-O-Mat still had to include it; and since that party provided no opinion on any of the questions, I scored 50% agreement with them (since I answered every question with 'yes' or 'no') — this is more than with the Liberal Party (because we actually disagree on half of the 38 questions). This is a flaw in the Wahl-O-Mat. If you say 'yes' (or 'no') to a thesis that the party has no opinion on, then it is counted as one point, while two points are awarded for a direct match. However, it does not work the other way around — having no opinion on any question brings up a window telling you that your preference cannot be properly evaluated. Because of this, I determined my position relative to the political parties using a neighbour-net. The primary character matrix is binary, where 0 = ‘no’, 1 = ‘yes’ and ‘?’ stands for no opinion (neutral), compared using simple (Hamming) pairwise distances. So, if two parties disagree for all of the theses their pairwise distance will be 1. If there is no disagreement, the pairwise distance will be 0. Since the PfHR has provided no opinion, I left it out (ie. its pairwise distances are undefined). Fig. 1 Neighbour-net of German political parties competing in the 2017 election (not including me). Parties of the far-left and far-right are bracket, for political orientation. Parties with a high chance to get into the next Bundestag (passing the 5% threshold) are in bold. [See also this analysis by The Political Compass, for comparison]. The resulting network (Figure 1) is quite fitting: the traditional perception of parties (left-wing versus right-wing) is well captured. Parties, like the ÖDP (green and conservative), that do not fit into the classic left-right scheme are placed in an isolated position. The graph reveals a (not very surprising) closeness between the two largest German political parties, the original Volksparteien (all-people parties): the CDU/CSU (centre-right, the party of the current Chancellor) and the SPD (centre-left). The SPD is the current (and potentially future) junior partner of the CDU/CSU, its main competitor. According to the graph, an alternative, more natural, junior partner of the CDU/CSU would be the (neo-)liberal party, the FDP. The parties of the far-right are placed at the end of a pronounced network stem — that is they are the ones that deviate most from the consensus shared by all of the other parties. They are (still) substantially closer to the centre-right parties than to those from the (extreme) left. However, the edge lengths show that, for example, a hypothetical CDU/CSU–AfD coalition (the AfD is the only right-wing party with a high chance to pass the 5% threshold) would have to join two parties with many conflicting viewpoints. That is, regarding their answers to the 38 questions, in general the CSU appears to be much closer to the AfD than to it's sister party, the CDU. Regarding the political left, the graph depicts its long-known political-structure problem: there are many parties, some with very unique viewpoints (producing longer terminal network edges); but overall there is little difference between them. 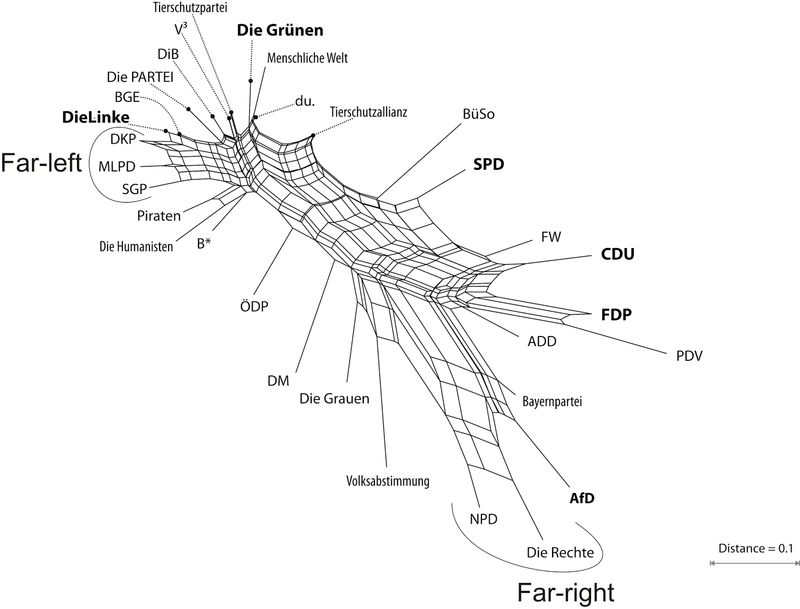 The most distinct parties in this cluster are the Green Party (Die Grünen) and the Humanist Party (Die Humanisten), a microparty promoting humanism (see also Fig. 2). Any formal inference is bound by its analysis rules, which may represent the primary signal suboptimally. The neighbour-net is a planar graph, but profiles of political parties may require more than two dimensions to do a good job. 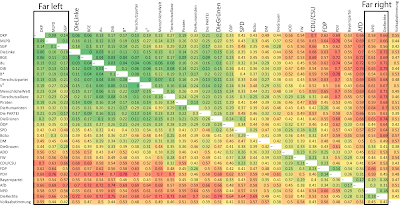 So let's take a look at the underlying distance matrix using a ‘heat map’ (Figure 2). Fig. 2 Heat-map based on the same distance matrix as used for inferring the neighbour-net in Fig. 1. Note the general similarity of left-leaning parties and their distinctness to the right-leaning parties. We can see that the Left Party (Die Linke) and the Bündnis Grundeinkommen (BGE), a single-topic party founded to promote a basic income without conditions, don’t disagree in any point, and that the declining Pirate Party (flagged as social-liberal on Wikipedia) has turned sharp left. The Party for Animal Protection (Tierschutzpartei) and the Party of Vegetarians and Vegans (V3) should discuss a merger; whereas the Alliance for Animal Protection (Tierschutzallianz) is their more conservative counter-part, being much closer to e.g. the CDU/CSU. We can also see that the party with the highest agreement with the SPD is still the Greens (Die Grünen). Furthermore, although the FDP and the Pirate Party have little in common, the Humanist Party (Die Humanisten) may be a good alternative when you’re undecided between the other two. [Well, it would be, if in Germany each vote counts the same, but the 5% threshold invalidates all votes cast for parties not passing the threshold.] 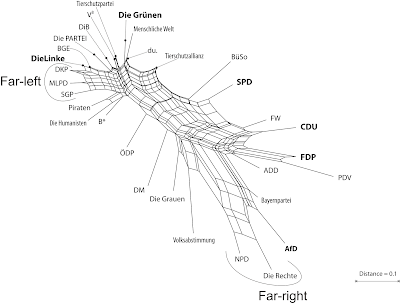 The most unique party, regarding their set of answers and the resulting pairwise distances, is a right-wing microparty (see the network above) supporting direct democracy (Volksabstimmung). Applications such as the Wahl-O-Mat are put up for many elections, and when documented in the way done by the German Federal Institute of Political Education, provide a nice opportunity to assess how close are (officially) the competing parties, using networks. PS. For our German readers who are as yet undecided: the primary character matrix (NEXUS-formatted) and related files can be found here or on figshare (includes the matrices for other elections as well).